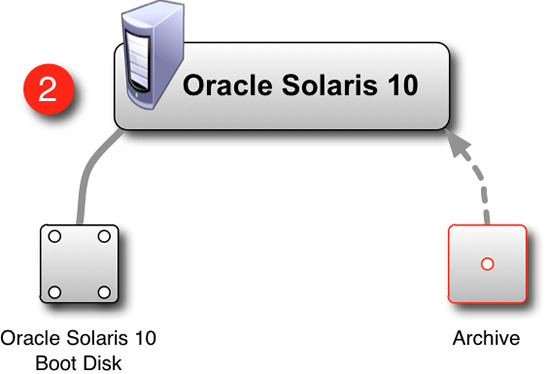 This article describes the steps you can perform to migrate from Oracle Solaris 10 to Oracle Solaris 11 11/11 with minimal downtime. Note, that this procedure will not work for Oracle Solaris 11.1 or later. Administrators are expected to use the integrated software management tools to update systems once migrated to a later release. First, you create a set of ZFS send archives—golden image—on an Oracle Solaris 11 11/11 system that is the same model as your Oracle Solaris 10 system. Then you install this golden image on an unused disk of the system running Oracle Solaris 10 to enable it to be rebooted into Oracle Solaris 11 11/11. 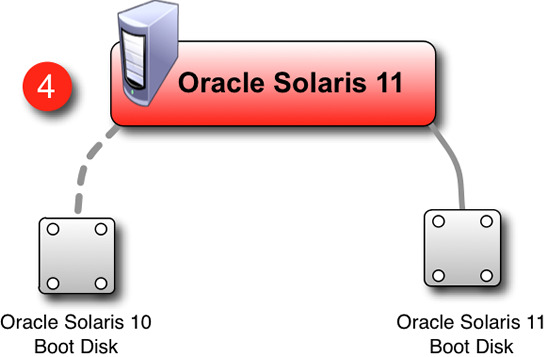 The basic system configuration parameters from the Oracle Solaris 10 image are stored and applied to the Oracle Solaris 11 11/11 image. Note: Migrating the installed software to a system of a different model is not supported. For example, an image created on a SPARC M-Series system from Oracle cannot be deployed on a SPARC T-Series system from Oracle. Also, at this time, this procedure applies only to migrating to Oracle Solaris 11 11/11, not to other releases of Oracle Solaris 11. 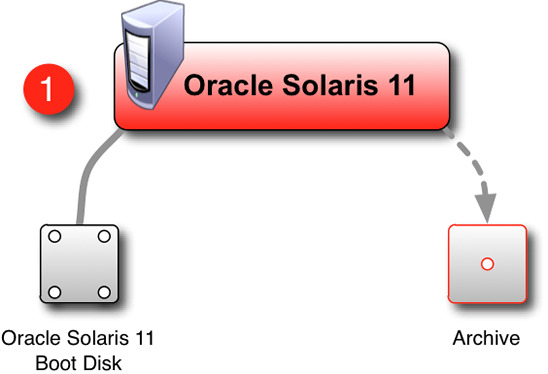 The archive system is a system on which an Oracle Solaris 11 11/11 archive is created. The migration system is a system that is currently running Oracle Solaris 10 and is being migrated to Oracle Solaris 11 11/11. You start a superuser-privileged shell on the Oracle Solaris 10 system that is to be migrated to Oracle Solaris 11 11/11 (the migration system). You select and configure a boot disk device and you create the new ZFS root pool. You restore the archived ZFS data sets in the new pool. You perform the final configuration and then reboot the migration system. The archive system and the migration system are the same model (for example, SPARC T-Series) and they meet the Oracle Solaris 11 11/11 minimum requirements. 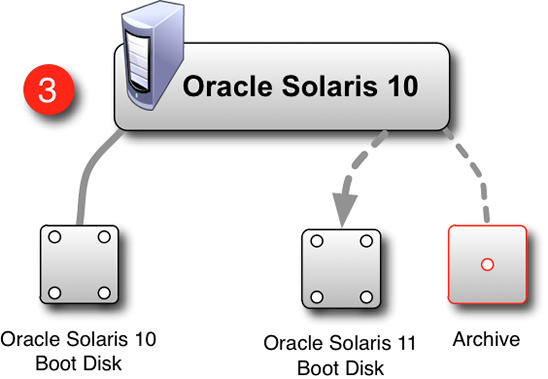 The migration system is running Oracle Solaris 10 8/11 or later, which is necessary in order to have a version of ZFS that is compatible with Oracle Solaris 11 11/11. If the migration system is running Oracle Solaris 10 8/11, apply the following ZFS patch before attempting to restore the archive. Without this patch, any attempt to restore the archive will fail. The patch is not necessary with any later release of Oracle Solaris 10. Note: The migration system must be rebooted after applying the patch. Ensure that the disks that will house the new ZFS pool are at least as large in total capacity as the space allocated in the archived pools. This is discussed in more detail in the Preparation section. You must have root privileges on both the archive system and the migration system. The archives will carry with them all the software and configuration information that resides in the ZFS data sets that are archived. Note that the migration of zones via a system archive is not supported. After the migration is complete, you can migrate Oracle Solaris 10 zones into solaris10 branded zones using separate procedures that are outside the scope of this document. Also note that it is not possible to run Oracle Solaris 8 or Oracle Solaris 9 zones on an Oracle Solaris 11 system. The archive that is created will not have the desired system configuration since will be created on a different host than the host on which it will eventually be run. Configuration of the archive (after migration) is covered in Phase 4. It will be necessary to reconfigure each boot environment in the archive after the migration is complete and before Oracle Solaris 11 11/11 is booted. For this reason, the archive should contain only a single boot environment (BE). Figure 1 depicts what happens when you create the Oracle Solaris 11 11/11 archive. To prepare for migration, note the disk topology and ZFS pool configuration for the root pool on the migration system. Configure the target disk on the migration system similarly to the disks on the archive system, and size the new ZFS pool appropriately. At a minimum, the allocated amount of the pool (the ALLOC column in the zpool list output shown below) is required to ensure there is enough room to restore the data sets on the migrating system. If any archival pool's capacity (as shown by the CAP column) exceeds 80%, best practices dictate that the migration pool should be grown to plan for capacity. Increasing the headroom in the pool can also be beneficial to performance, depending upon other configuration elements and the workload. To prepare for later migration, save the output from various commands to a file that is kept with the archive for reference during migration. Listing 1 shows the commands that are recommended as a bare minimum, but other configuration information might be useful, depending upon the system configuration. The commands shown in Listing 1 with example output are for rpool only. /dev/dsk/c5t0d0s0 is part of active ZFS pool rpool. Please see zpool(1M). Place the information shown in Listing 1 from the system being archived, along with anything else that might be useful during migration, in a file, and store the file in the same location as the archive files for use later during the migration. Alternatively, you can use the Oracle Explorer Data Collector to gather all system configuration information for later reference. To archive the root pool and include all snapshots, you need to create a ZFS replication stream. To do this, you first create a recursive snapshot from the top level of the pool, as described below. In the same manner, you can archive other pools that need to be archived and carried over to a migrated host. Note that rpool is the default root pool name, but the root pool might be named differently on any given system. Use beadm list -d to determine on which pool the BE resides. In the remainder of this article, the default name rpool is used to reference the root pool. Use the following command to create a recursive snapshot of the root pool. The snapshot name (archive, in this example) can be based upon the date or whatever descriptive labels you desire. Next, delete the swap and dump device snapshots because they likely do not contain any relevant data, and deleting them typically reduces the size of the archive significantly. Note: Regarding the dump device, it is possible, though unlikely, that the dump device has data that has not yet been extracted to the /var data set (in the form of a core archive). If this is the case, and the contents of the dump device should be preserved, dump the contents out to the file system prior to deleting the dump device snapshot. The following commands delete the default-named swap and dump device snapshots, though there might be more deployed on a host. Now that the snapshot has been prepared, the next step is to send it to a file for archival. If you are archiving more than one ZFS pool, each pool will have a snapshot, and each snapshot needs to be sent to its own archive file. The following steps focus on creating the archive for the root pool. However, you can archive any other pools on the system in the same manner. To send the snapshot to a file, you pipe the zfs send command into a gzip command, as shown below, which results in a compressed file that contains the pool snapshot archive. When creating this archive file, it is a good idea to use a unique naming scheme that reflects the host name, the date, or other descriptive terms that will be useful in determining the contents of the archive at a later date. You can save the archive file locally for later relocation or you can create it on removable media. The location where you store the archive file should be a file system that is backed up regularly. Also, although compression is used, enough storage space should be available on the file system. A good rule of thumb is to have enough capacity for the sum of the ALLOC amounts reported by zpool list. Use the following command to create the archive file locally. The archive file name can be any string that helps identify this archive for later use. A common choice might be using the host name plus the date, as shown in the following example. Now, move the archive file to a file server for later retrieval, as shown in Figure 2. # zfs send -Rv rpool@archive | gzip | ssh USER@FILESEVER "cat> /path/to/archive_$(hostname)_$(date +%Y%m%d).zfs.gz"
Note that if you stream the archive across the network, the ssh transfer does not support any sort of suspend and resume functionality. Therefore, if the network connection is interrupted, you will need to restart the entire command. The system configuration information must be regenerated when the archive is restored. This is done by generating the System Configuration (SC) profile on a running Oracle Solaris 11 11/11 system and then copying that profile to the restored Oracle Solaris 11 11/11 archive so that it is automatically applied upon first boot. The create-profile subcommand of sysconfig invokes the SCI Tool interface, queries you for the system configuration information, and then generates an SC profile you can use later to configure the system. Use the following command to create an SC profile locally. The profile name can be any string that helps identify the profile for later use. The following example uses config with date information appended. Then move the SC profile to a file server for later retrieval. Optionally, you can create the SC profile and write it directly to an NFS-mounted path, as shown below. Figure 3 depicts what happens when you migrate the Oracle Solaris 11 11/11 archive. The first step is to configure the new boot disk device. As previously mentioned, you can replicate the original disk layout or you can use a different layout as long as the following steps are taken and space at the beginning of the disk is reserved for boot data. The root pool does not need to be the same size as the original. However, the new pools must be large enough to contain all the data in the respective archive file (for example, as large as the ALLOC section in the zpool list output, as described previously). Decide how to configure the boot device based upon the initial disk configuration on the archive system. To reiterate, what is required is that ultimately the ZFS pools you create are large enough to store the archive data sets described by the ALLOC amounts in the output of zpool list. Use the format(1M) command to configure the disk partitions and/or slices, as desired. For boot devices, a VTOC label should be used, and the default configuration is a full-device slice 0 starting at cylinder 1. The files that were saved as part of the archive creation can provide guidance on how to best set up the boot device. The example in Listing 2 shows how to select the desired boot device from the format utility's menu. Type "y" to accept the default partition, otherwise type "n" to edit the partition table. Now configure the slices as needed. Listing 3 is an example of setting up a full-capacity slice 0, which is the default configuration. The slice starts at cylinder 1 to leave room for boot software at the beginning of the disk. Note that the partition table might look different based upon your system architecture, disk geometry, and other variables. Once the slices are configured as needed, label the disk, as shown in Listing 4. Confirm the overall layout prior to moving on to the next step. Ready to label disk, continue? Note that if the archive system's root pool did not use the default name, rpool, use its name instead of rpool. The migration procedure is able to complete successfully when a different pool named is used, but the resulting ZFS file system will have a different mount point. The next step is to restore the ZFS data sets from the archive file. If the archive is stored on removable media, attach and configure that media now so that the file can be accessed. Alternatively, if the files are stored on a networked file server, you can use the following command to stream the archive file and restore the data sets. Note: The receive command might generate error messages of the following form: cannot receive $share2 property on rpool: invalid property value. This is expected and will not affect the operation of the restored data sets. If other pools were archived for restoration on this host, you can restore them at this point using the same ZFS operation shown above. he data migration portion of the procedure is now complete. Some final steps must be performed now to ensure that the migration system will boot as expected. Next, you need to create swap and dump devices for use with the migration system. Note that the default-named devices are being used in this article. Therefore, no further administrative tasks are required (for example, adding the swap device using swap(1M)), since the devices were already in use and are configured to run with this system at boot time. If the migration system has a memory configuration that varies from the system that was archived, the swap and dump devices might require a different size, but the names are still the same as in the previous configuration and, thus, they will be configured properly on the first boot of the migration system. The swap and dump devices should be sized according to the advice in the Oracle Solaris Administration: Devices and File Systems and Oracle Solaris Administration: ZFS File Systems guides, which is roughly as shown in Table 1. Note that once the system is booted, you can add additional swap devices if needed. Use the following commands to recreate swap and dump devices with appropriate capacities. Note that in this example, the migration system has 8 GB of memory installed. BEs are located in the root pool in the rpool/ROOT data set. Each BE has at least two entries: the root data set and a /var data set. The BE in the example above is solaris_11. The BE's root file system can now be accessed via the /tmp/mnt mount point. The first step is to install the boot software that will allow the host to boot the new root pool. The steps are different depending upon architecture, as shown below. Both examples use the /tmp/mnt BE mount point. Next, you need to direct the system to perform a reconfiguration boot on first boot, which will configure any new device hardware (as related to the archive system versus the migration system). To force a reconfiguration boot, you place a file named reconfigure at the top level of the BE's root file system. This action is not persistent, because the file is removed and, thus, the reconfiguration occurs only on the first boot after the file is placed. Next, two Oracle Solaris Service Management Facility profiles that are included in the Appendix (/tmp/disable_sci.xml and unconfig.xml) need to be copied to /tmp/mnt/etc/svc/profile/site. These profiles will cause the system to do an unconfigure before applying the SC profile generated earlier. Now, copy the generated SC profile to the appropriate location, which is /tmp/mnt/etc/svc/profile/sc. This directory might not exist, so it might be necessary to create it. Then reboot the migration system. As depicted in Figure 4, the migration system should now be as the archive system was, barring any changes in the system configuration, physical topology, or peripheral devices, or any other hardware-related changes. Listing 5 shows the contents of the disable_sci.xml profile. Listing 6 shows the contents of the unconfig.xml profile.